Trung To is a very interesting individual. He’s a senior at Hoover High, and he’s been at Hoover for all four years. Trung’s a pretty good student, has never failed a class. He usually passes a class with a B or A, and at the lowest, a C. The lowest grade Trung has ever received was a D, and it was for the first semester. 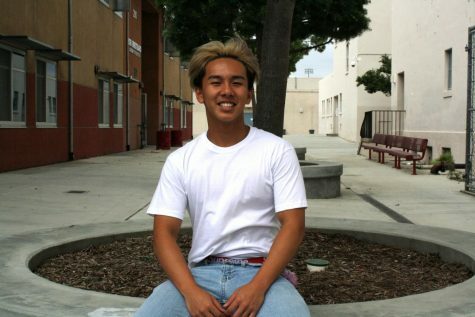 Trung is most notably known for his long blonde hair he had last year. Trung is mainly known for his crazy stunts he does. His friends all know his personality is one that’s always upbeat and silly. He never fails to make his friends laugh, whether it’s just a regular day at school, or if they’re not feeling well. Trung will always make sure to leave a smile on his friends. In his pastime, Trung usually plays badminton, powerlifts, or his spending his time learning about something, and sometimes sleeping. He’s played badminton ever since his freshman year, and he fell in love with the sport. It’s a sport that requires the strength of a football player, and the grace of a ballet dancer. Trung recently started powerlifting this year, and he’s really strong for a guy who’s his size. He’s most proud of his deadlift, which is 275, nearing 300 pounds. Any other time he’s not doing those things, he’s probably sleeping or eating.